In case you don't remember, here are some before shots of my living room. These focus in on the corner I just re-did! You can click on any of the photo to make them larger. 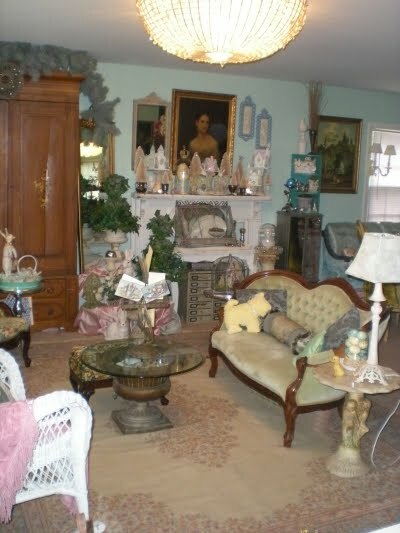 The entire "before" post on my living room is here. I love the giant armoire--circa 1820 made of chestnut and beautifully stenciled with birds, fruit, flowers, and faux raised paneling--all original! but it made that whole corner so dark. I've had these mirrors for some time now, just lying around! (really) I'm so glad I finally got them hung! I took the corner cabinet from the dining room, and generally moved around accessories, etc. I traded the former mahogany and floral print chair for this pink chaise--it is so comfortable! I took a nap on it yesterday! Now this corner is so much lighter and brighter! The wonderful teal chippy dresser was an indirect birthday present! My aunt gave me some birthday money, and I went antiquing! I just love this piece--you can't faux an authentic patina like this! Georges candelabra and giant clam shell filled with garden twine, and another fleur-de-lis. Antique water bottles make great vases, plus the great teal color really emphasizes the teal, pink, and green color scheme going on. 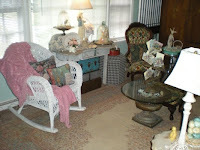 I so love painted furniture! Look at the detail in the antique gilded frames. My favorite giant chandelier makes a cameo appearance in this shot! I just love how the light reflect in the antique bottles! Here is one last picture of the first part of my living-room re-do! I hope you enjoy. Your comments are much appreciated. Please follow my blog--I will follow back--to be sure I follow back, comment that you follow my blog! Make sure your privacy settings are such that I can view your blog through your comment or profile! I hope you all have a wonderful Sunday! I'm off to church now--then maybe to a local park for a walk, even though I need to finish putting my living room and dining room back together!